PARADISE NOW puts a human face on suicide bombings. 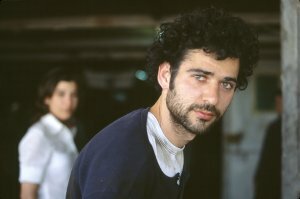 The film, directed by a Palestinian, Hany Abu-Assad, and produced by a gaggle of European companies (joined by Palestinian and Israeli entities), tells the story of two friends, Said and Khaled, who live in the war-torn, poverty-stricken West Bank and volunteer to put on explosive vests, cross into Israel and blow themselves up in crowded, downtown Tel Aviv. Working from a script he co-wrote with his Dutch producer, Bero Beyer, Abu-Hassad shot the film under difficult and dangerous conditions. Just about all the political forces in the area, ranging from rival Palestinian factions to the Israeli army, were suspicious of the project. 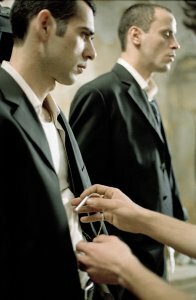 One faction thought Abu-Assad was making a film against the suicide bombers, another supported him because they believed he was fighting for freedom and democracy. The Israelis accused him of making an Arab propaganda film and gave him and his 70-man crew a hard time. On top of that, the shooting war between Jews and Arabs heated up during principal photography in the Nablus encampment. There was a nearby missile attack, repeated gunfire, intrusions by soldiers demanding to know what was going on. "Not one day went by without having to stop filming," Abu-Assad said. "We would stop and wait until the firing stopped and then start again." It literally became a life-and-death struggle to finish the film. 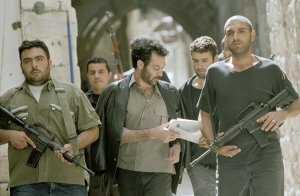 When some Palestinian gunmen kidnapped Abu-Assad's location manager and demanded that his crew leave Nablus, the director shut down the shoot. A half dozen of his European crew quit and went home. "I didn't blame them," said the director. "They did the right thing. Life is more important than a film." Yet he and most of his team stayed and toughed it out. They obviously believed they were dealing with a film worth being brave for. Abu-Assad appealed to then-Prime Minister Yasser Arafat for help in obtaining the location manager's release. Filming resumed in Nablus, but when a land mine exploded 300 meters away from the set and the lead actress, Belgian-born Lubna Azabal, fainted, Abbus-Assad knew it was time to split. He moved the production to his home town of Nazareth, where new sets had to be built, changes made to the script. The budget money ran out, causing filming to be shut down again. Somehow additional funds were found and the movie was completed. The point of view in PARADISE NOW is always from the Palestinian side. Israel is the enemy, the oppressor, in Said and Khaled's eyes, yet, as one of them says, "the Israelis have managed to convince the world that they are the victims, not us." Anger and resentment over their bleak, hopeless, dead-end lives is what drives them to become suicide bombers. Shame as well, in Said's case, if only because his father was caught collaborating with the Israelis, and executed. But it would be wrong to conclude that Abu-Assad has been content to make a propaganda film. Said's girlfriend Suha (Azabal) delivers a blistering attack on suicide bombing, the thinking and proselytizing behind it, the spurious belief that it will reward bombers with a direct pass to heaven. Suba's impassioned speech dissuades at least one of the two would-be killers. It also proves that there is wisdom, humanity and compassion on the Palestinian side, not just blind hatred. Abu-Assad has also told his story in compelling, expert fashion. It is paced like a thriller but its characters have depth and heft. I found myself caught up in the story, moved by its suspense and power. Abu-Assad has also been well served by his actors and particularly by his cinematographer, Antoine Heberle, who has given PARADISE NOW a gritty, realistic look and feel.